Even though I am in my mid 20s plus ten, I like to dream and pretend that I live in a seaside villa. Sure my seaside villa is an hour away from the actual sea, but on any map, we are quite close compared to our friends in say... Kansas. So this weekend I will be stationed on my new CAL KING and looking out to the sea (via the blogosphere, my pictures, and some good old fashion imagination). I have not been getting the best rest lately but last night was the beginning of a new sleep era for me. For those of you on the fence about getting a new bed and whether mattress designs, really matter --> They do!!! The bedroom is where our dreams happen and I this weekend I will be dreaming and planning, and organizing so that my dreams can come true. picture from our friends @ Anthroplogie. 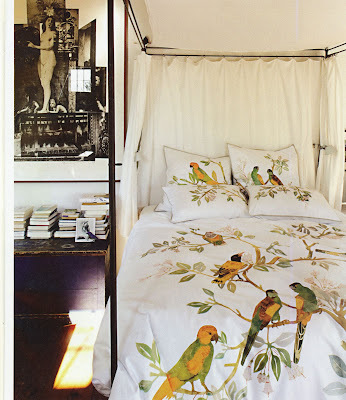 It is the watercolor aviary bedding. Oh and yes...you do live much closer to the ocean then say....those people who live in Indiana! You are still young by my standards! Pretty bedding. I'm into birds & other critters lately- in sculpture and home furnishings, not so much linens. But they're lovely here, nonetheless. That room looks serene and comforting. I'm dreaming of...new adventures, art, and floating in the sea (haven't been in the water lately). dreaming about california...which was amazing..thanks for the twitter check in! I am always dreaming....at the moment I am dreaming of a little sun as its raining!